Composite: Map Of The Region Adjacent To The Bay Of San Francisco. Shell San Francisco and Vicinity. North Sheet: Map Of The Region Adjacent To The Bay Of San Francisco. 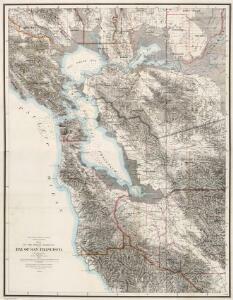 South Sheet: Map Of The Region Adjacent To The Bay Of San Francisco. San Mateo, Santa Cruz, Santa Clara, Alameda, and Contra Costa Counties. 1 : 253440 Blum, George W.